Home / Unlabelled / BUHARI’S YEARS ON THE SADDLE: Another Wasted Opportunity. Events on Tuesday in Nigeria of May 22 amongst many others illustrate the assertion that His Excellency, President Muhammadu Buhari will go down hard in Nigeria's history 📖 crashing and unsuccessful like he's predecessors. On that day, the victims of the Mbalom Church massacre in Benue State were buried. The killings which claimed the lives of two Catholic priests and 17 parishioners sparked condemnation worldwide and was a subject of a nationwide protest by Catholics. ‎It has become a pattern. Even though all these Nigerian leaders sometimes issue statements and acts to portray their administration as pillars who cares as well as intended to make a change for the better. They are often perceived to take delight in pleasing a section of the Nigerian people perhaps those they believe will get them "Reelected". It's no longer news in Nigeria that a president that haven't sat on a saddle for at least two consecutive years haven't made an impact yet. Half a decade impact is a most, whilst a requirement for their names to be engraved on that Rock whether negative or not. At the beginning of his administration, the president made clear the direction in which his government would go. Despite the occasional pandering towards statesmanship, the president has consistently been true to his words. Shortly after he was sworn in and precisely, on July 22nd, 2015, the president ‎was on an official visit to the United States where he had to speak at the United States Institute of Peace (USIP). After the president had spoken, members of the audience were invited to ask questions in a session moderated by former Under secretary of State for African Affairs Johnnie Carson. Dr. Pauline Baker, the President Emeritus of The Fund for Peace, said to the president: “My question relates to another area of Nigeria that hasn’t gotten a lot of attention during this trip and that is the Niger Delta. It’s a challenge that you are going to face. I wonder if you would tell us how you intend to approach it with particular reference to the amnesty, bunkering, and inclusive development?” amidst other questions. Mr President was quoted saying: “I hope you have a copy of the election results. The constituents, for example gave me 97% cannot in all honesty be treated on some issues with constituencies that gave me 5%. A scrutiny of the Buhari’s three years in office reveals that the president continues to govern in accordance with the statement he made during that visit to the US. Given the fact that he emerged president from an election that showed that the nation had been divided along ethnic lines, the president’s first priority should have been to embark on measures that would unite the country. However, President Buhari failed to assure those who did not vote for him that he is a president for all. He had the opportunity to rally Nigerians behind him as a united people but the president failed in this regard. That is a lost opportunity. Having been elected as president of the Federal Republic of Nigeria, he was expected to be president of all, not only of the people who gave him 97 percent of the votes. Those that also gave him 5% of the vote which got him elected are also fellow Nigerians that believed in him but unfortunately happened to find themselves in the other half of the divide. Today, activists will gather at Unity Fountain in Abuja and elsewhere in Nigeria to hold a solemn service in remembrance of those who had lost their lives to the killing spree now taking place in Nigeria. It is part of the activities lined up for the National Day Mourning. The group coordinating the event, Office of the Citizen, which is made up civil society organisations, has been crying out loud hoping that someone in government would take decisive steps and stop the killings but nobody listened. According to the Office of the Citizen, the level of impunity and frequency of killings in Nigeria in recent times is a source of grave concern to citizens. Though not just under Buhari, Nigeria has become a killing field. The administrations are always in denial until it becomes too late. Later, the attitude was that it was not a big deal. When the burial of 57 people killed in one fell swoop in Benue became a national embarrassment, the presidency shocked Nigerians by saying that they had killed more people in Zamfara State. Meaning that the presidency could not understand why the nation was making a fuse over the killing of 57 people in Benue after all more people had died in Zamfara State without anyone shouting about it. That is the absurd level to which governance has been elevated. Instead of campaigning to get reelected, the president should work extremely hard to justify the four-year mandate already given to him. Trust Nigerians, if Buhari has ruled well, they would have been more than happy to give him a second term. He will not even need to campaign for it. He would have earned it on a platter of gold. Whilst the slogan "Sai Baba." The Christian Association of Nigeria (CAN) made the point when it called on the president to suspend his campaign for a second term till he had addressed and stopped the killings by herdsmen. 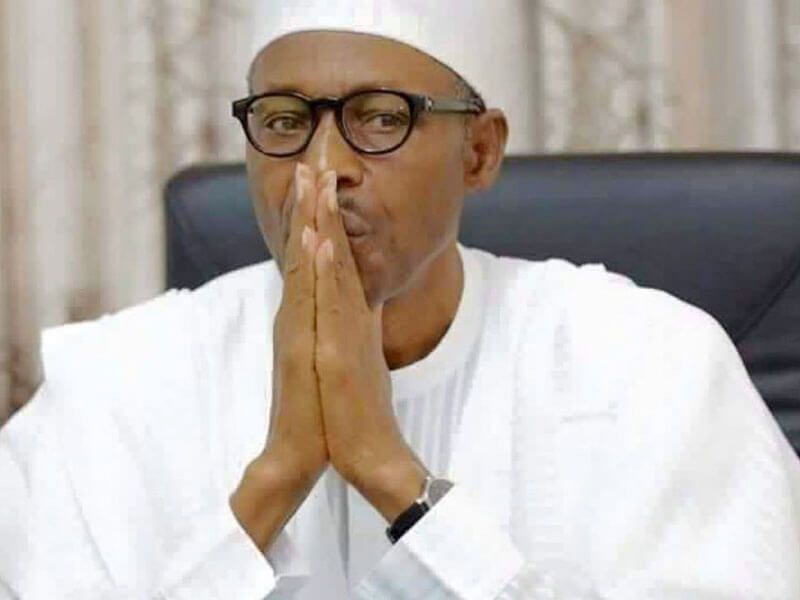 CAN, in a statement by its spokesman, Pastor Bayo Oladeji, said, “While CAN is not opposed to the President’s exercise of his civic right by seeking re-election for the second time, we urge him to halt it for now and attend to the security problems occasioned by the criminal activities of the terrorists, herdsmen and bandits. The brazeness with which herdsmen, bandits and militias killed people across the country and the government’s lacklustre response forced many to allege that the killings were being sponsored by those in authorities. A tough response from government would have served as an assurance for the people. But the government of Muhammadu Buhari failed to reassure people. Those he delegated powers to such as the Inspector General of Police were simply overwhelmed, whilst he's busy transmitting the country's commission into confusion. As if to add salt to the injury of those who have lost loved ones to killer herdsmen, those in authority were defending the killers and justifying the killings. For instance, the Minister of Defence, Mansur Dan-Ali provided justification for the attacks by suspected armed herdsmen when he attributed their nefarious activities to the enactment of anti-open grazing laws in some states. Recently, President Buhari blamed former Libyan leader Muammar Gaddafi who was killed in October 2011, almost seven years ago, for the ongoing herdsmen carnage in Nigeria. According to Archbishop of Canterbury, Justin Welby, who visited him at the Nigerian House quotting the president that "Gaddafi supporters found their way into Nigeria and that they are being used to slaughter innocent Nigerians". A government that can not protect lives and properties has no reason to remain in power a day longer. Since the return of democracy in 1999, no time has the unity of the country been threatened as much as it is under progressive administration. ‎President Buhari's actions and inaction forced people to seek protection under their regional or tribal associations. The South-east and the South-south felt completely isolated. IPOB threatened secession. Calls for the country to be restructured. Former President Goodluck Jonathan is known to be an orator. However, there are two statements credited to him that, in our view, make him stand out as an icon. During the 2015 presidential election campaign, Jonathan reportedly said that his ambition to get reelected was not worth the blood of any Nigerian. The president once wrote on his Facebook wall: “My dear friends on Facebook, “I have said it before and I will continue to say and live by the fact that my ambition, and indeed the ambition of anybody, is not worth the blood of any Nigerian. Therefore, I urge all Nigerians to look forward in hope as we fulfil the dreams of our founding fathers to ‘build a nation where peace and Justice reign'”. This statement is commended to President Buhari. Making a case for good leadership, the former President stated further that he always felt sad each time people said negative things about Nigeria, noting that it has got to a stage where the nation’s neighbours cite the country as a bad example. He said: “A President of a neighbouring country, Ghana, recently made two negative remarks about Nigeria. First, the current Ghanaian President was addressing Ghanaians about the movement of cattle within their shores and he said openly that Ghana is not like Nigeria where cattle roam freely. That was quite uncomplimentary. It is another missed opportunity to make Nigeria a better place for all. Another aspect of the concept of rule of law is accountability. How come is it that thousands of people have been killed but not a single person has been convicted for the killings? That in itself is an incentive to continue the killings. Nigeria, as a country can’t protect people from being killed and can’t arrest and prosecute those who killed others. Can the President, His Excellency (Muhammadu Buhari) take advantage of the remaining one year of his term to turn the long journey of the nation's walk to chaos around?